As fans of the Star Wars saga, we are frequently immersed in the story, film, or collectibles and sometimes forget that behind all the creativity poured into Star Wars, none of this would be possible with the foundation of Star Wars as a business. George Lucas began work on Star Wars immediately after release of his hit film, American Graffiti, in 1973. To begin work on Star Wars, Lucas needed to settle several details to get others involved, receive services for that work, and agree to payments and credits for those services. 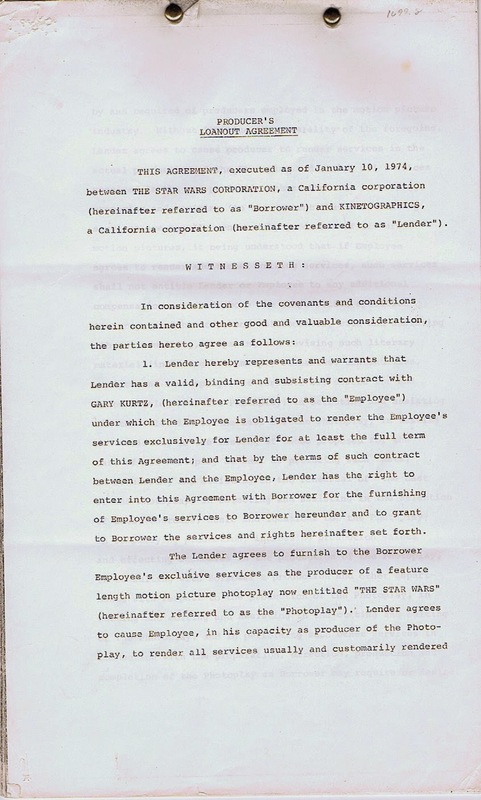 This employment contract between George Lucas and Gary Kurtz, dated January 10, 1974, outlines the terms of their employment agreement. Kurtz had worked with Lucas on American Graffiti, and this Producer's agreement states that Kurtz would get full credit on the film, The Star Wars. The single exhibit to the contract gives details about the film credit that Kurtz would receive, "Produced by Gary Kurtz," and other specifics such as Guild requirements and size of the credit. In the document, The Star Wars Corporation agrees to pay Kurtz $50,000 for producing the film and 5% of net profits of the film (with some legalese about how net profits are calculated). The bulk of the agreement specifies details about the services provided by Kurtz. 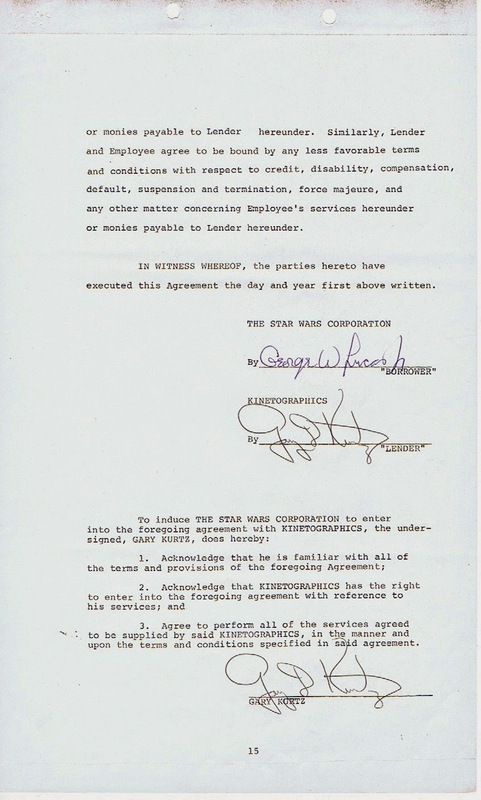 The final page of the main body of the contract has signatures by George Lucas (representing The Star Wars Corporation) and Gary Kurtz (Kinetographics). Kurtz's company, Kinetographics, was incorporated January 16, 1974 in California. For The Empire Strikes Back, Harrison Ford's employment agreement (as "Harrison Ford Productions") is with Chapter II Productions Limited, the production company for the film. Chapter II was founded in June 1978 and opened its offices in October of that year. 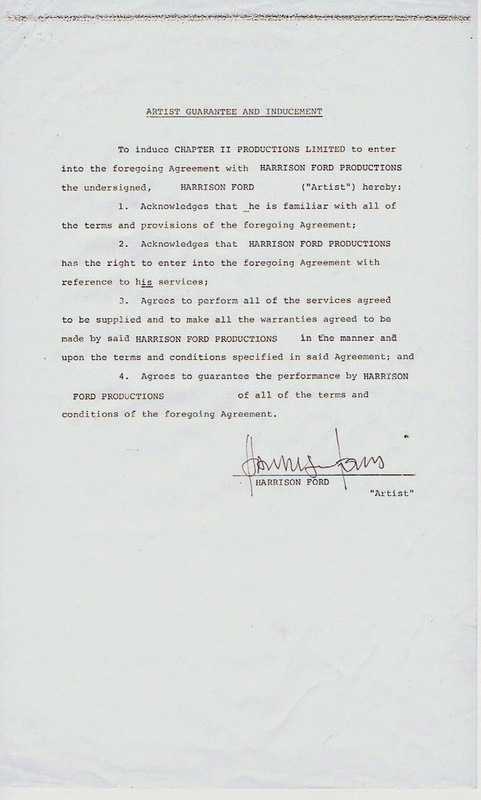 The contract between Ford and Chapter II references other agreements, specifies that Harrison Ford Productions represents Harrison Ford's services, and guarantees the performance of Harrison Ford on the production. These legal documents are all directly signed by the principals. At the time, these may have served as boiler plate legal agreements to conduct business, but in light of the unparalleled success of Star Wars, these documents seem more like historical artifacts to the collector. Both were recently added to the Archive Database, along with some other entries which can be found in the New Acquisitions section.